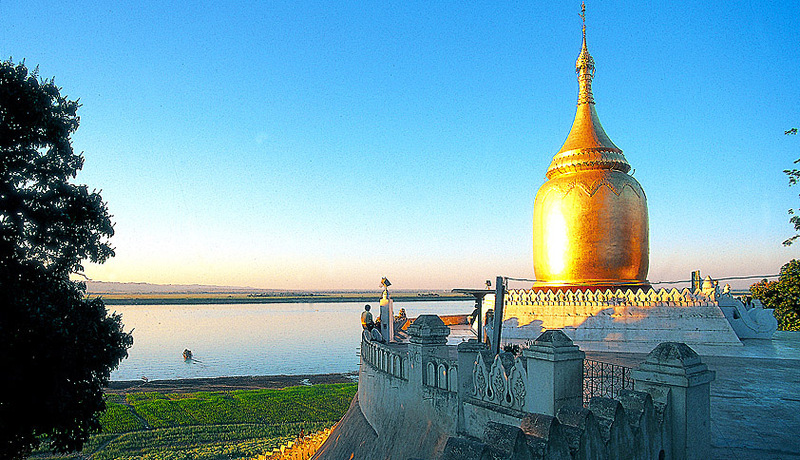 Irrawaddy River Cruises from Bagan to Mandalay. Cruising down the brown water of the mighty Irrawaddy (Ayeyarwady) River from Mandalay to Bagan is a absolute highlight (usually 2 days) during any trip to the country although a very costly one. Cruise between Bagan & Mandalay. Europe and between Thailand and Malaysia Singapore) started this famous river cruise in Myanmar (Burma). 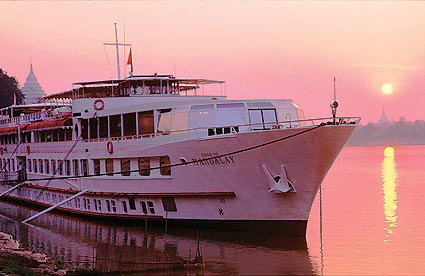 The RV Road to Mandalay was carrying tourists on the River-Rhine before until it was shipped in a dry dock around the half world to be used in the tropical environment of Myanmar. A journey between Bagan and Mandalay won’t take long (between 2 and 4 days depends on the booking ) but the experience is overwhelming it is like standing around at the riverbank and the open air panorama is moving over several hundreds years.. From time to time the river vessel e.g. 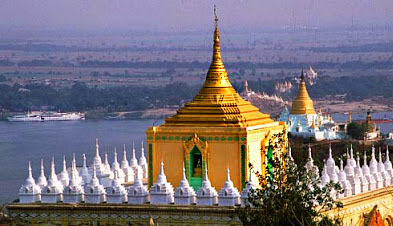 "The Road to Mandalay" make a stop to explore the villages behind the Irrawaddy River (Ayeyarwady River). The pagoda studded Irrawaddy River cruise sector between Mandalay and Sagaing is one of the most attractive parts because of the scenes with Buddhist pagodas temples and monasteries. There are several ship operators with different vessels some of them are refurbished steamer of the "Irrawaddy Flotilla Company" which was registered in Glasgow Scotland during British times they got refurbished and still do a great job. RV Road to Mandalay is pictured from the west side of the Irrawaddy River. Thousands of travelers to Myanmar.have made this floating tours with partying shopping and a great insight into the country. The brown waterfront is passing in front of the cabin windows since this Asian waterway is quite large on certain sectors it is often difficult to see the banks. The lazy shallow brown water coming down from Kachin State in the Myanmar Himalayas often blends with the scenery behind without an horizon. One of the better cruise vessels is the "Road to Mandalay" operated by the "Orient Express" company it's great and expensive. A luxury float with all imaginable comfort the vessel did the job on the river Rhine before. Cruising near Kawthaung at the south end of Myanmar the former Victoria Point opposite of Ranong in Thailand this is the most popular destination for the visa run in south Thailand.